Please join us to raise awareness of the issues of hunger and homelessness in our community and nationwide for the 15th Annual “One Night without a Home” walk on Wednesday, November 14th, 2018 in observation of National Hunger & Homelessness Awareness Week , Nov. 11 – 18. Participants will gather at Grace House at 3:30 p.m. and walk to Old Central School and return to the Grace House shelter for a chili dinner at 5:00 p.m. provided by the Itasca County Salvation Army Disaster Team. National Hunger and Homelessness Awareness Week is a national endeavoy by the National Coalition for the Homeless to promote education, action and awareness about hunger and homelessness. 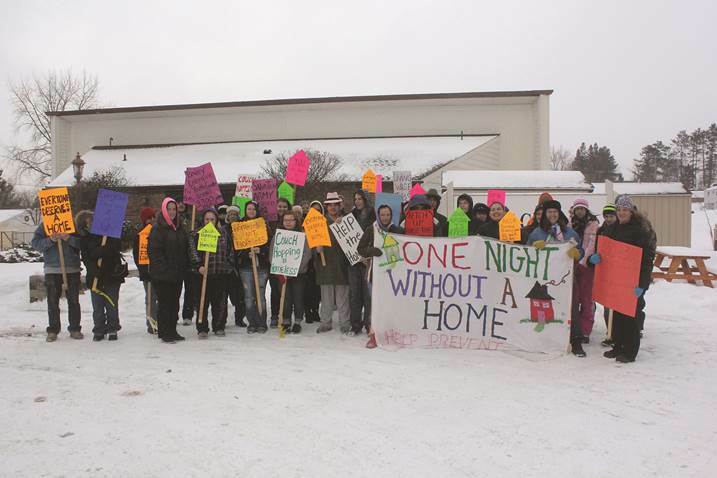 Itasca County events are coordinated by the One Night Without a Home sub-committee of the Housing Issues Advisory Committee, a group of community partners in Itasca County who work with housing and support services for people who are homeless in Itasca County. For more information, or if you have questions regarding the upcoming events, call Jessyca or Ron at Grace House, 218-326-2790, Heidi at AEOA, 218-322-6500 or Haley at Kootasca, 218-999-0800.